Gas Fired Central Heating with new condenser boiler. Inset stove with back boiler. Modern fitted kitchen with gas hob. Rear garden and side access. Village location close to many lakes and Shannon/Erne Waterway. REA Brady are delighted to bring this 3 bedroom semi-detached house in the well established estate of An Crannog to the market. Presented in excellent condition this house has many features including modern fitted kitchen with gas hob, double oven, integrated appliances, inset stove with back boiler, Gas Central Heating and rear garden with side access. Located in the village of Keshcarrigan and close to nearby Drumcong National School and playschool, this house would be ideal for a first time buyer or retirees. Within 15 minutes drive of Drumshanbo or Carrick on Shannon this house is ideally located and is also surrounded by many lakes and nearby Shannon Erne Waterway for water enthusiasts. 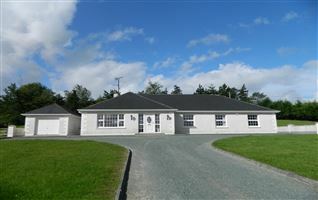 Contact Celia in REA Brady to organise a viewing. In Keshcarrigan village turn right opposite Gerties Pub. Continue out this road past single stroey grey stone building on left. Take next left and left again. House for sale on left with purple door. Entrance hallway with large cream tiles, power points, stairs which are carpeted leading to first floor, ample room to create storage space under stairs. Downstairs wc fully tiled with whb, mirror, towel rail and radiator. Large living room to front of house with inset stove with back boiler, granite fireplace, wooden flooring, radiator, large window to front garden. Large bright and modern kitchen, living and dining area to the rear of the house. Modern kitchen with ample storage space, integrated dishwasher, washing machine and fridge freezer. Gas hob and electric oven. Large cream tiles on flooring and tiled over wooden effect counter top, double ceramic sink. Patio doors to rear patio area and garden. Spacious double bedroom, carpeted, wardrobes, window to front garden, tv point, power points. Ensuite with pumped power shower, tiled floor and walls, whb, wc, radiator, towel rail and mirror. Spacious double bedroom, carpeted floor, radiator, window to rear garden. Bedroom to front of house with carpet, radiator, power points. Bathroom with bath with shower attachment, wc, whb, mirror, fully tiled walls and floors.